I love talking with students and readers about writing! If you're interested in having me visit your school or library, I'd be happy to work with you to tailor an event that fits your needs. Please contact me at sarah@sarahbethdurst.com to arrange an appearance. 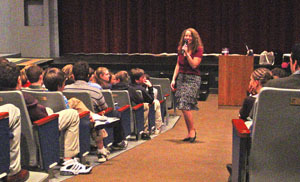 I offer school visits for grades 3 to 12. I am also available for virtual visits with schools, libraries, and book clubs. In my presentation, I discuss my path to becoming a writer and my writing process, with an emphasis on how to write imaginative fiction and the joys of revision. For grades 3-5, my talk focuses on my recent middle-grade books (The Stone Girl's Story, Journey Across the Hidden Islands, and The Girl Who Could Not Dream). For grades 6-8, I discuss a mix of my MG and YA titles. For grades 9-12, I center my presentation on my teen and YA-crossover novels (The Deepest Blue, The Queens of Renthia series, Drink Slay Love, Fire and Heist, etc.). Fees vary depending upon location and duration. Books for the event can be ordered directly from the publisher at a 40% discount. Orders should be placed 6-8 weeks in advance of the event. Local bookstores are also often happy to work with you to arrange book sales before and at the event. I look forward to hearing from you and (hopefully) meeting you! Website created and maintained by Sarah Beth Durst and Adam Durst.